So - you've bought yourself one of those old, impressive Nikon F5-based Kodak DSLRs, only to realize you've brought home a potential power nightmare? No need to panic. Here's everything you need to know. 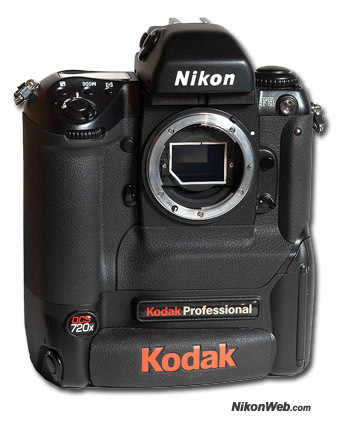 The following info applies to all Kodak Professional DCS 600- and 700-series models, which were built around Nikon's F5 camera body (like the 720x pictured here). It also applies to all Canon mount DCS 500-series cameras. They all use the same batteries. The information on this page comes from different sources, including Kodak documentation, online discussion forums, and electronics development engineer Stan Disbrow (which is also an active forum member here on NikonWeb.com). First, you should know that there are two different types of Kodak batteries for these cameras: There's a Ni-Cd battery which was originally sold with the camera, and a newer Ni-MH version (KODAK PROFESSIONAL Premium Plus). You can still find original Kodak batteries on eBay and elsewhere, but it's probably better to get a third party replacement. Kodak's original spare part number (for the newer Ni-MH battery) is 4E1631 (the battery itself is labeled 4E01110), but replacement batteries are sold under different labels, like UL-CAT926 and BNH-358. They're easy to Google, and typically cost somewhere in the $50 to $100 range (May 2009). Considering the huge price difference, it's a good idea to check several sources before you buy. Tip: A NikonWeb forum member bought a $38 battery from BestBatt.com. Another one mentions: "Also the batteries from 500/600/700 series are very easy to re-cell. Inside there are 6 4/5 -size NiMH/NiCD cells and the battery casing is easy to open. My local battery dealer does one for about 30 euros." Original Kodak Ni-Cd packs have white printing on their labels, not gold, and there's a Ni-Cd recycling logo on the back label. The gold printed packs (KODAK PROFESSIONAL Premium Plus) are all Ni-MH, but they don't say so. There's no recycling logo at all on the Gold packs. They're easy to tell apart. Both the Ni-Cd battery and the Ni-MH battery can be charged in either the older style flat-top charger or the slant-top charger. Note: When charging a Ni-MH battery in a flat-top charger, the green light may not illuminate. To obtain a full charge, the battery should remain in the charger for a minimum of 4 hours regardless of the color light displayed. 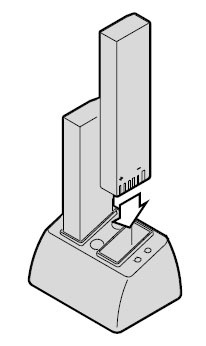 * While you can use a battery when the light turns green, you will have optimal results if you leave the battery in the charger for two hours after the light turns green. Unlike batteries, there are no third party chargers readily available (there was a third party charger at some point, but apparently it's rare and hard to come by). Kodak's part number is 4E6066. If you're patient, you'll probably be able to find a charger on eBay. Alternatively, you can buy a complete DCS kit (they're much easier to find), keep the charger and sell the rest. Or you can use a lab-type bench power supply. Read on. From a 2001 article on robgalbraith.com: ".. to extract maximum performance from a NiMH battery pack, it must be run through three conditioning (charge/discharge) cycles when new." And: "..that even if the photographer's EN-4 wasn't triple-conditioned when new it may not be too late to do it now. A triple-condition to try and jumpstart things really can't hurt and may help restore lost capacity." This particular article discuss Nikon D1 batteries, but the advice should apply to all Ni-Mh batteries: D1X Tip: breaking in the EN-4 battery. Additional info: Contrary to some advice, DO NOT press the charger's refresh button as the first step when breaking in a new battery. The only correct way to handle a brand-new pack is to fully charge it right out of the box. That will force all cells in the pack to the same capacity level. Then, it'd be fine to discharge it by use in the camera until the camera indicates the pack is exhausted. After that, use of the charger load resistor (by engaging the refresh button) would not cause a problem. You can just charge it all the way up and then hit the refresh button to discharge it. You'll be waiting for quite a few hours for the load resistor to drop a fully charged pack, though. It's better to just use it in the camera until it runs out of charge. Battery life is primarily a factor of usage. Generally the more a battery is used, the longer it lasts. A fully charged Ni-Cd battery gives approximately 200-300 shots (1100 mA hours), depending on how the camera and the battery are used. A fully charged Ni-MH battery gives approximately 800 shots (1700 mA hours). A fully charged Ni-MH battery should have a voltage between 8.2 to 8.7 V.
Heavy use of auto-focus, frequent card replacements, and excessive use of the camera LCD for image viewing reduces the number of shots from a single battery charge. Take this into consideration when estimating battery life. Shelf life: When not in use, both Ni-Cd batteries (originally sold with the camera) and Ni-MH batteries (KODAK PROFESSIONAL Premium Plus Rechargeable Batteries) have a shelf life of approximately 1 year. A battery can sit without use for 1 year and still be rechargeable as long as the battery voltage does not drop below 2.4 V.
Stan Disbrow comments: These shot counts are for the 2 megapixel cameras, not the 6 megapixel ones. I get 400-430 shots out of my 760 with a 2100 mah brand-new pack writing to a 2 GB SanDisk Ultra-III card. I get less with older cards, and even less with a microdrive. I only ever got 300-350 shots on my 560, the 660 I once had, using what were, at the time, good Kodak NiMH packs. Now, the 620x I once had got 800 or so shots on a Kodak NiMH pack. The 720x I use now, get 1000 shots out of the same 2100 mah NiMH pack that the 760 only gets 400 or so out of. As mentioned above: Batteries must have at least 2.4 V to be recharged. Unlike a modern DSLR, the Kodak DCS cameras keeps waking up to see if you've engaged the camera's ON switch. If so, it powers everything up. If not, it goes to sleep again. This will quickly drain the battery, even when the camera is turned OFF. The solution? Remove the battery when the camera is idle for more than 6 hours (source: Kodak), or see "Resurrect dead batteries", below. Ni-MH batteries, such as the KODAK Premium Plus Rechargeable Battery, may be charged at any time. For best results, remove the battery before, or as soon as, the battery icon flashes. Once the icon flashes, there are only 7 to 10 shots available before the battery is completely depleted. Stan Disbrow comments: Kind of useless info these days. Guys that re-cell their own with Ni-Cd already know about the old memory issue and how to deal with it. Actually, any Ni-Cd made after about 1990 has moderators in the electrolyte that eliminated the issue. Luckily, there's still hope even if the battery has dropped below 2.4 V. In January 2002, photographer Reed Hoffmann described a procedure on robgalbraith.com, where he gave his bad DCS battery a boost using a household 9 V battery (typically used in smoke detectors, toys, radios, etc.) and a pair of paper clips. You'll find the recipe here: Resuscitating Kodak DCS NiMH batteries. Note: You don't have to use a 9V battery. You can instead use another, working DCS battery. According to a forum post: "within five minutes you have raised the terminal voltage of the "dead" one high enough to charge." The idea is to set the supply voltage to something on the order of 20% higher than the pack rating. Then, set the current limit to something reasonable, like a half an ampere. What this will do, is give a high enough current to get the chemicals moving well inside the cells. I usually use a pair of small washers stuck into the + and - contact slots in the pack, then hook up a pair of clip cords from the supply to the pack and wait about a minute. This rapidly charges the pack up to where the charger will now think it's a good pack and charge it the rest of the way. 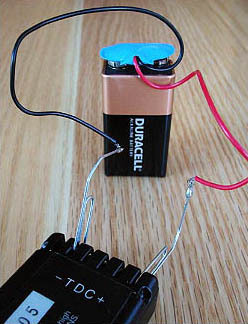 Another method, which doesn't require any paper clips, bench power supplies or other fancy tricks: "I had two batteries which died from being left in the camera and I simply plugged in the AC adapter to the camera with the battery in the camera. After a few minutes or so, I removed the battery and the charger charged it right up." Not sure if this will work with all dead batteries (anyone? ), but it's worth a try, especially if you already have an AC adapter. And here's yet another variant: "With my 620x nimh batteries, I just stick the totally dead batteries in the charger, wait for the flashing yellow, yank it out, wait a couple seconds and stick it back in over and over and over. About the sixth or seventh time, I get the solid yellow and the battery charges up." Set the supply to the rated pack voltage and limit the current to 100 milliamps and it will charge the pack to about 80% in a couple hours. These bench lab-type supplies will automatically drop the current as the voltage rises until it hits the set voltage value at which point the current will be zero. Charging at 50 millamps would be even better. That's the overnight rate. You'll ramp the voltage more slowly, and so hit more like 95% of the charge that you'd get with the charger. If you're not in a hurry, that is. Notice that Ni-MH cells are much fussier than Ni-Cd's, so it's important not to get too high on the charge current and to set the voltage limit to the rated pack voltage so as to get away with the bench supply charge trick. Ni-Cd's can take up to the cell amp-hour rate for input current and can absorb 20% overcharge. So, we usually set the voltage higher than the rating and let the current flow and so get a fast charge time. Can't do that with Ni-MH unless one has processing capability to watch the voltage slew rate and the temperature climb rate and so adjust the current on the fly to charge as fast as possible without any overcharge whatsoever. That's why the chargers have processors in them. To watch the fool things like a hawk. 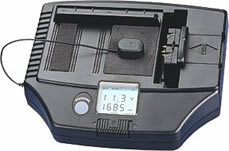 Alternatively, you can use a universal charger/analyzer/conditioner like the MAHA MH-C777PLUS-II (photo), which replaces the older MH-C777PLUS which was reviewed by steves-digicams.com in 2002. From an old robgalbraith.com forum post: "It is a GREAT charger. I used it to charge Kodak DCS batteries for almost 3 years. works better than either of the Kodaks. It will charge most all battery packs, including canon EOS3/1V, EOS 1D, Nikon D1's and many more. I have 2 and never had a problem with either one." Needless to say, everything you decide to do is at your own risk! Be careful. More info from Stan Disbrow: One other thing I've discovered about these Kodak DSLRs that seems to not be known - Kodak changed something in the camera code for the 700 series and they're far pickier with packs than the 500 and 600 series are. I have one original Kodak pack left. It gets a couple hundred shots on my 560 still. It gets about ten on the 760 before the camera pukes on the pack and won't fire and gives a flat pack indication. All I can think of is that the pack voltage is dropping quite a bit when shooting several shots in a minute or so (not bursting as in sports shooting even, just several individual shots within a minute) and the camera sees this as being out of the ordinary. Well, it is, but the chemistry eventually catches up and the pack voltage then rises back up. The 760 balks on this, while the 560 cares not. I mention this as the 720x has the exact same response to that pack. Oh, the shot count is higher of course. Smaller imager takes less power per shot, but then one tends to burst fire with a sports shooting camera and so it sometimes pukes on the pack even faster than the 760 does. I no longer have another 520, 620 or 620x, but I expect they'd not mind this pack at all. In other words, don't hold out a lot of hope for an original Kodak pack with any 700-series body these days. If you plan on actually using the camera 'in anger' as I do, then get two new packs while you're at it. Unless you're a skilled technician and can change the internal battery yourself, you probably shouldn't care. Apparently, it's an expensive operation - if you can still get someone to do it. From an old forum post: "My friendly(?) dealer has just quoted the equivalent of $42 for the battery, and $507 for fitting the damn thing." One of the replies: "The part is inexpensive, but the camera requires a complete strip down to the main board. The battery is a soldered component also." Luckily - and this is important - the camera will still work just fine - you'll just have to press OK to get rid of the "Time/Date Incorrect" warning when you turn the camera ON. Annoying, maybe, but no big deal. Note: Most of the time, pressing OK does the trick, but if it does not, just go into the menu and set the date. Well, I don't think that the connector Kodak used on the camera is robust enough for this. It's OK for a camera stuck on a tripod in a studio. Even then, I have to constantly be on guard that I don't trip over the cord as it comes right on out of the camera. You could make up a pack using 'c' or 'd' cell Ni-Cds in holders - usually four cells to a holder - and then series up the holders. You'd need six cells at 1.25v each, so maybe one could find a six-cell holder. Yes, you could use said cable and hook the mess up. Charging would be by commercial multi-cell charger, I suppose. Or, one could use a bench supply. If one uses a cell with 1.5v, then one needs five cells, though. There are one-cell holders, so if one got a 4-cell and a 1-cell and series them, then you're good. Personally, I prefer to use the internal pack that doesn't fall out when I'm shooting! These are relatively easy to find on eBay, but are obviously not very practical outside of a static (studio) environment. But they can be useful for recharging the internal battery (see "Time/date error" above). It may also be used to boost dead batteries, so that they can be charged using the regular battery charger. See Resurrect dead batteries above. 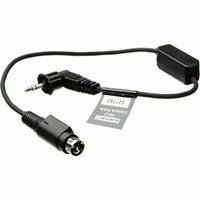 The AC adapter should not be confused with the battery charger's power supply, which is a different thing (they have different plugs, so there's no risk inserting the wrong one). Prices vary, so be careful - unless you're desperate, of course, in which case the price doesn't matter! This page is work in progress. Let me know if you have any questions, find any errors or have a great tip you want to share. Send an e-mail to webmaster @ nikonweb . com (remove spaces). Special thanks for Stan Disbrow for invaluable information, feedback and support. 9 volt battery/paper clip photo by Reed Hoffmann. Used with permission.